El Buxu Cave is situated in a limestone outcrop, in a small valley occupied by the Entrepeñs stream. 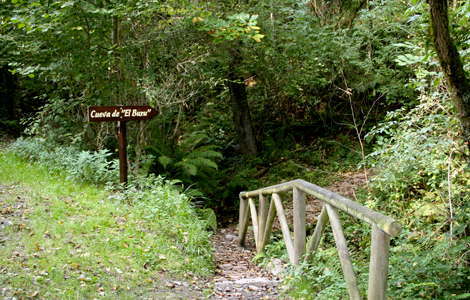 This is a tributary of the River Güeña, which in turn flows into the River Sella at Cangas de Onis, a town a few kilometres away from Cueva del Buxu. The cave was discovered by chance in December 1916 by Cesáreo Cardin, an habitual collaborator in the archaeological digs of Hugo Obermaier and Conde de la Vega del Sella. 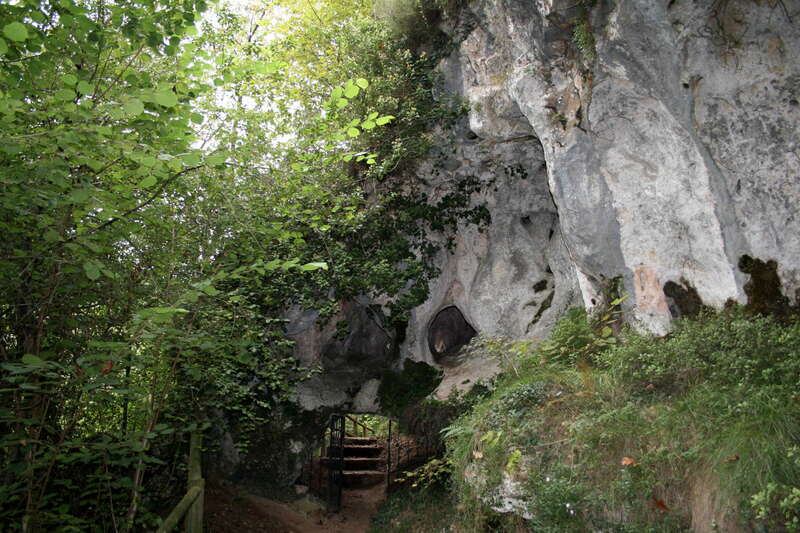 These had asked him to visit Cueva de Las Inxanas, located in the same hill as Cueva de Buxu. 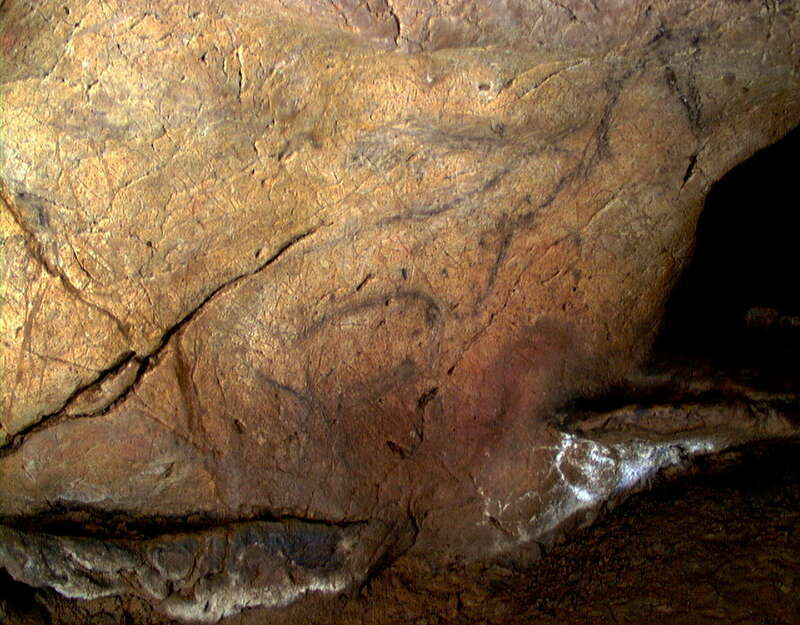 C. Cardin, mistaking El Buxu for that cave, entered and found its examples of parietal art. He immediately informed Obermaier and Vega del Sella of his discovery, and they began the study of its contents, publishing their results two years later. The cave has been modified drastically since then, mainly due to the work carried out to accommodate tourist visits. These changes not only substantially altered the aspect of the cave but also destroyed much of its archaeological deposit. The entrance is formed by an outer vestibule six metres wide and five metres deep, facing south-west. The original rock-shelter, however, was much larger, as is shown by the presence of numerous blocks of limestone which have collapsed from the roof, and the remains of a former floor, partially eroded away. This former rock-shelter would have faced south, situated 300 metres above present-day sea level, and 25 metres above the valley floor. Most of the archaeological deposit must have been in this outer area, and as we have mentioned it was practically destroyed by the work carried out in the cave in the 1950s. 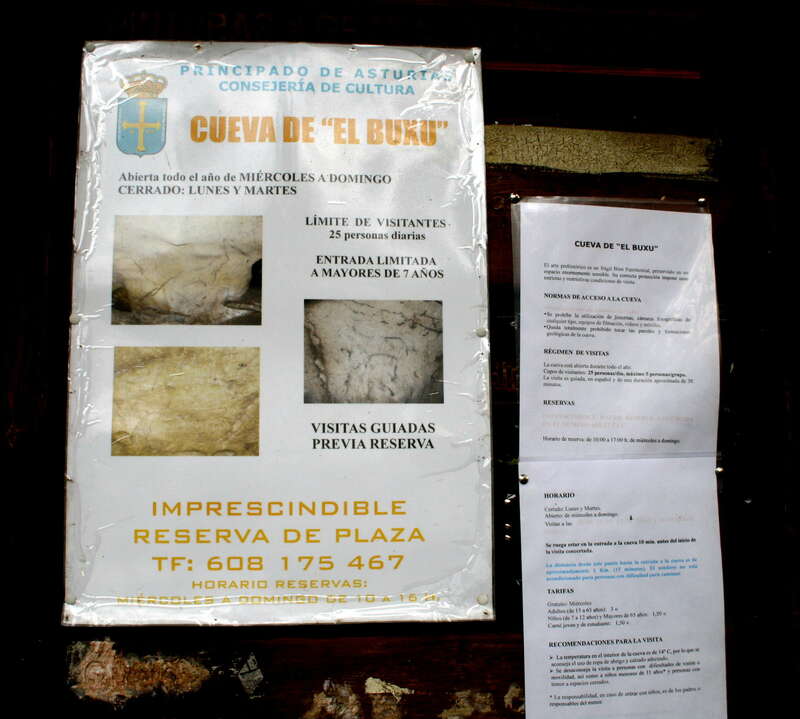 Information board on the pathway to El Buxu Cave. It is a very beautiful ancient wooded/karstic area. There are low limestone ridges nearby this coastal area. It is a very pleasant walk to the caves with the guide. The path is beautiful, with convenient wooden rails to hang onto if needs be. This is the entrance to the caves area, but the cave itself is further on, down the steps and through the tunnel. The limestone has been carved into amazing shapes by water at a time when the whole area was below ground level. Display board, showing a bird fashioned from a cave bear's canine tooth. 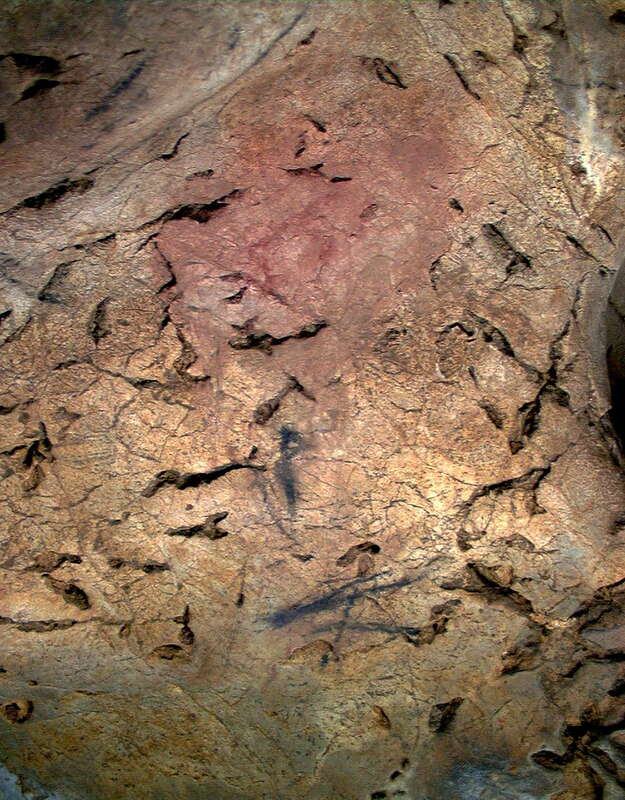 It represents a bird, possibly a spotted crake, found in the Solutrean layer. 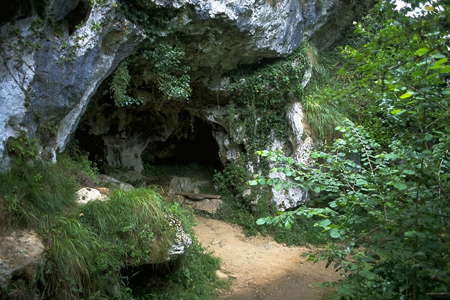 The cave was first excavated in 1918 by Vega del Sella and Hugo Obermaier. Looking back towards the gate through which we entered. 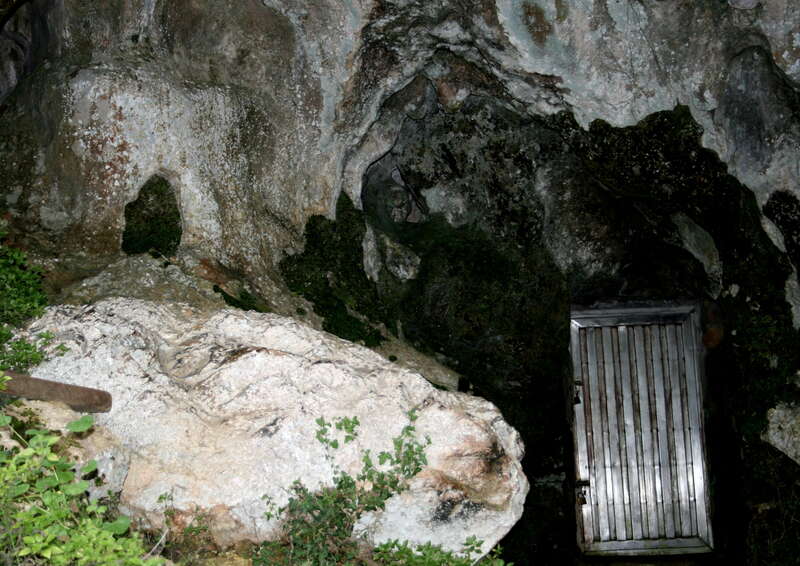 The metal door to the actual cave entrance. Not the original entrance, which is higher up to the left on the cliff face. 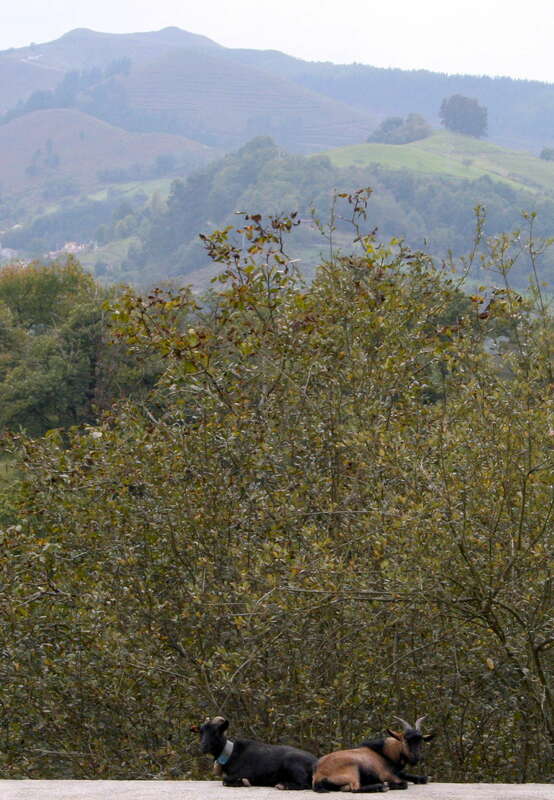 This is a small site, a sanctuary on a cul-de-sac, high above the inter-montane valley of Eastern Asturias. The mobile art found is very rare. During the Late Upper Paleolithic (Tardiglacial) this was a period of sharp climatic swings. It was probably used as a hunting camp and would have been an ideal place for driving game. 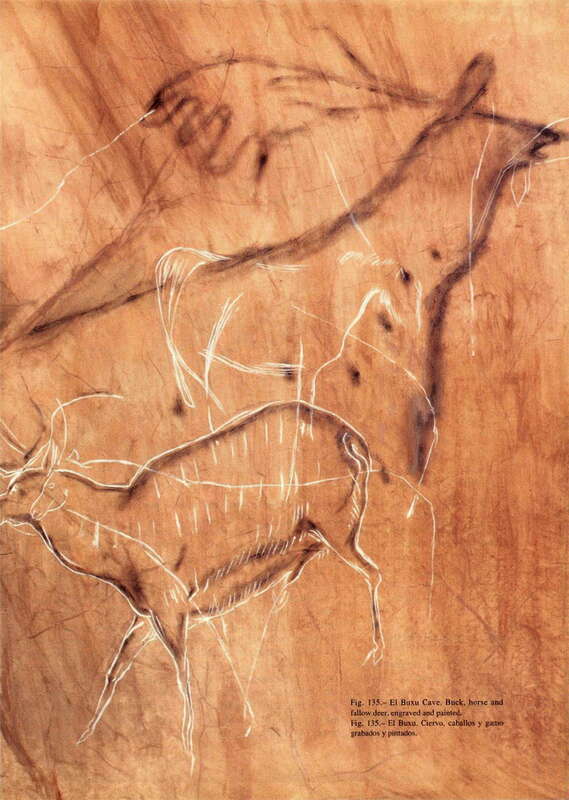 There are roaring stags painted on the wall, and 18 rectangular engraved signs (some with traces of black pigment) accompanied by paintings and engravings of 8 horses, 9 deer (plus one set of isolated antlers), 4 ibex, 2 bison and 5 indeterminate animals (Menendez et al., 1984). 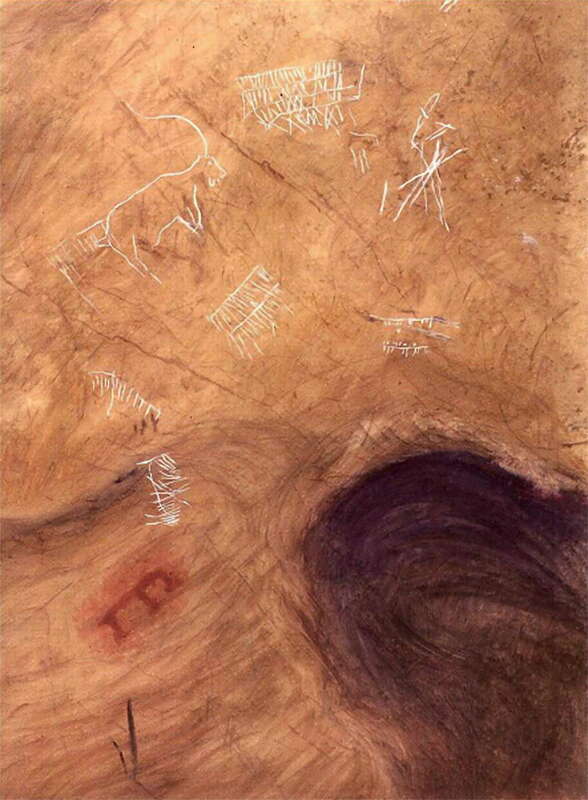 One of the paintings shows a beast being struck by weapons (Kuhn, 1966). Other references from Berenguer (1994). The original entrance was just above here. Another view of the entrance to the cave, 1998. 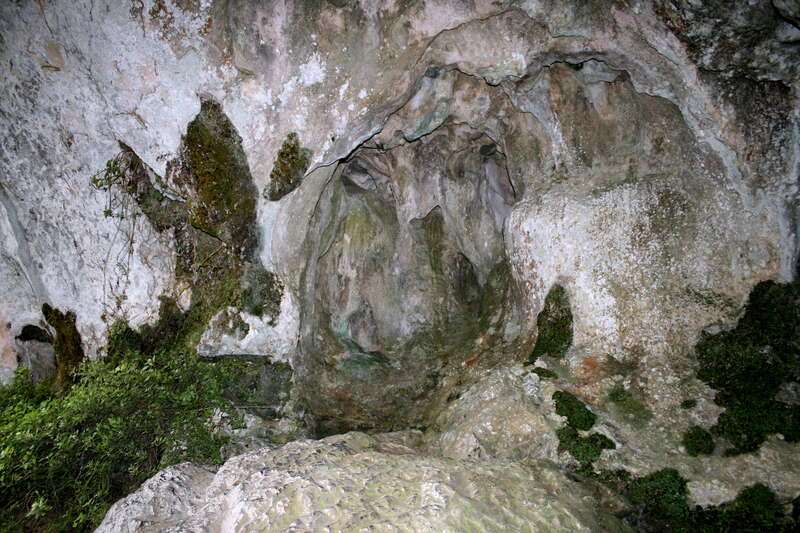 This cave is situated in a limestone outcrop, in a small valley occupied by the Entrepeñs stream. This is a tributary of the River Güeña, which in turn flows into the River Sella at Cangas de Onis, a town a few kilometres away from Cueva del Buxu. 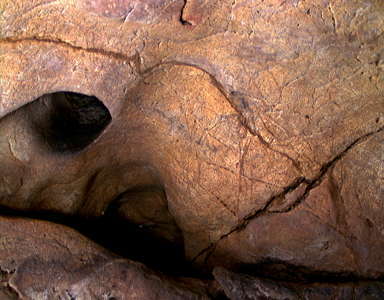 The cave was discovered by chance in December 1916 by one Cesáreo Cardin, an habitual collaborator in the archaeological digs of Hugo Obermaier and Conde de la Vega del Sella. 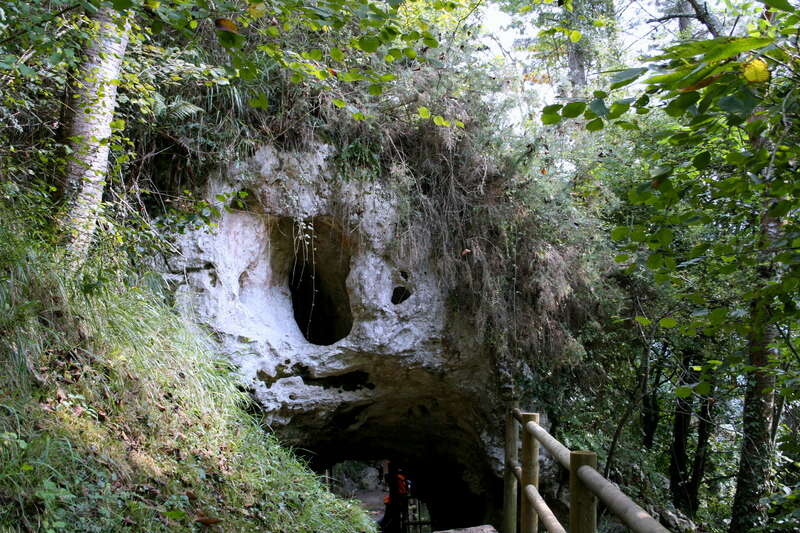 These had asked him to visit Cueva de Las Inxanas, located in the same hill as Cueva de Buxu. C. Cardin, mistaking El Buxu for that cave, entered and found its examples of parietal art. He immediately informed Obermaier and Vega del Sella of his discovery, and they began the study of its contents, publishing their results two years later. The cave has been modified drastically since then, mainly due to the work carried out to accommodate tourist visits. 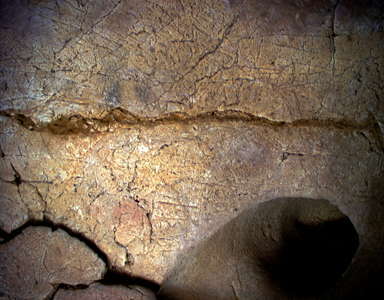 These changes not only substantially altered the aspect of the cave but also destroyed much of the its archaeological deposit. 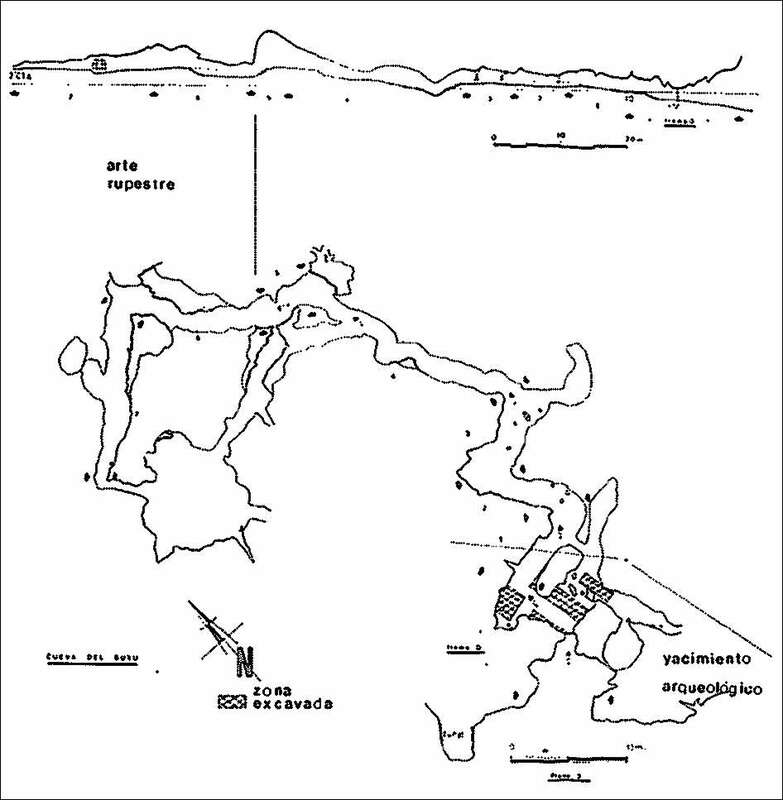 Plan of the cave, showing positions of artwork. The entrance is formed by an outer vestibule six metres wide and five metres deep, facing south-west. The original rock-shelter, however, was much larger, as is shown by the presence of numerous blocks of limestone which have collapsed from the roof, and the remains of a former floor, partially eroded away. This former rock-shelter would have faced south, situated 300 metres above present-day sea level, and 25 metres above the valley floor. Most of the archaeological deposit must have been in this outer area, and as we have mentioned it was practically destroyed by the work carried out in the cave in the 1950s. The right-hand wall of this rock-shelter has a very low entrance (now covered over) leading to passages without any apparent archaeological interest. 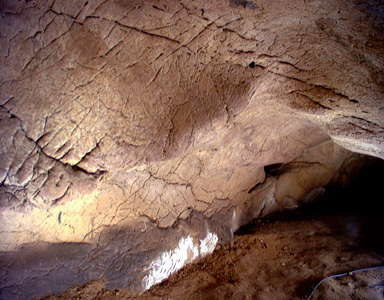 At the back of the rock-shelter, a hole 45 centimetres wide led into the interior of the cave. 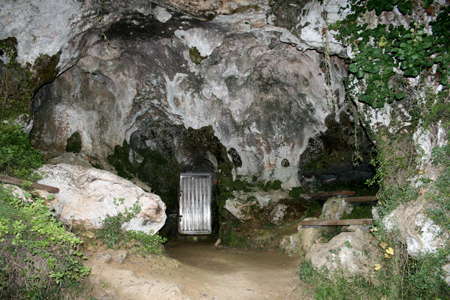 Nowadays the cave is entered through a metal gate, installed next to the original entrance. 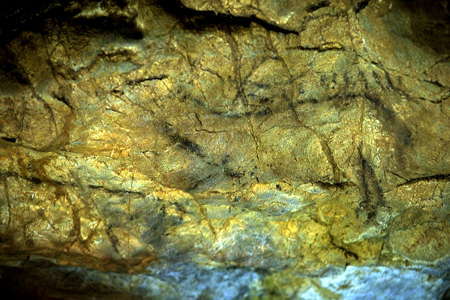 When this was discovered, it was so low that it was necessary to crawl on the floor towards the inner part of the cave. In order to make the visits easier, a trench nearly one and a half metres deep was dug in the rock-shelter and the first part of the cave passage. Fallow deer, stag, ibex, horse. 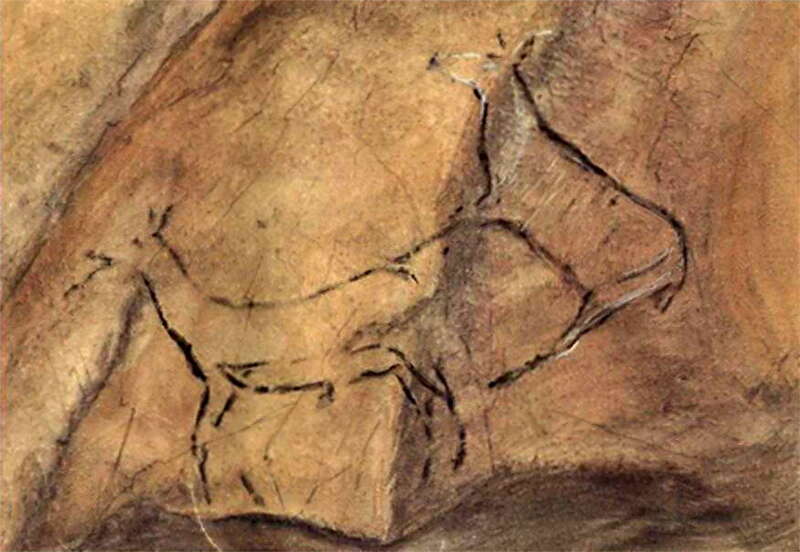 Several animal figures can be seen in this panel: a fallow deer, two ibex, a horse and two stags. Besides the fallow deer, the main figure is a large stag outlined in black and situated at the top right of the panel. 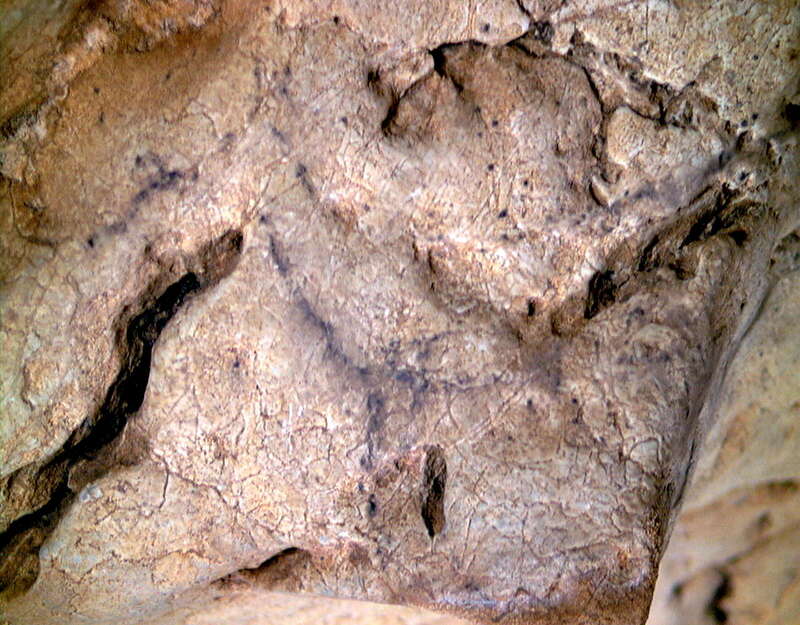 This painting has been poorly preserved, so that only the forelimbs, chest and part of the cervical-dorsal line can be seen. 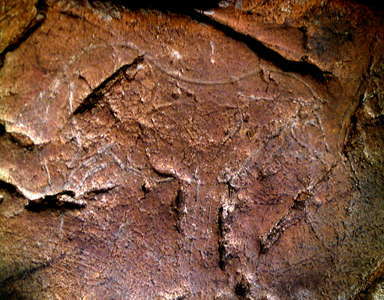 Inside the body of this stag it is just possible to see a few lines belonging to the engraving of an ibex. This is one of the most significant friezes in El Buxu, with a painted fallow deer, an engraved horse, two painted stags, and an engraved ibex. The main figure is apparently a fallow deer, facing right, with its forequarters outlined in black. 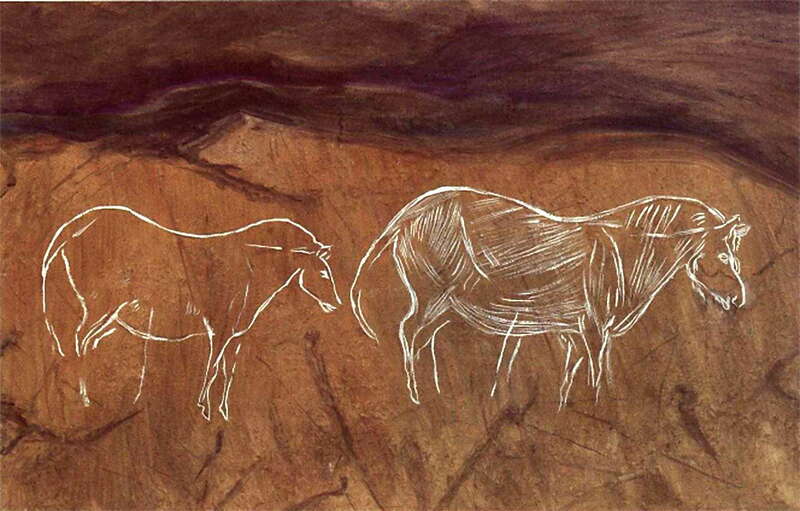 It is superimposed on a horse, seen in its interior, engraved with a very fine line and also facing right. 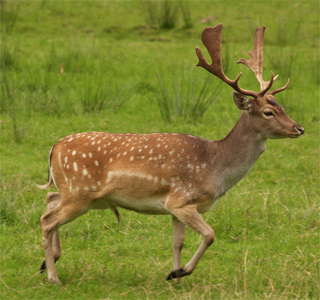 The most characteristic parts of the fallow deer are represented, especially its broad antlers. Immediately below the horse, a stag facing left is painted in black and engraved. An ibex is engraved in its interior, although this can hardly be seen nowadays. Finally, it should be noted that the black lines visible above the fallow deer belong to the forelimbs of a larger cervid. Besides the fallow deer, the main figure is a large stag outlined in black and situated at the top right of the panel. 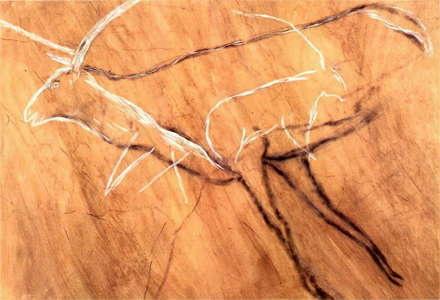 This painting has been poorly preserved, so that only the forelimbs, chest and part of the cervical-dorsal line can be seen. Inside the body of this stag it is just possible to see a few lines belonging to the engraving of an ibex. The Fallow Deer or Dama dama is a ruminant mammal belonging to the family Cervidae. This common species is native to western Eurasia. The male is known as a buck, the female is a doe, and the young a fawn. Adult bucks are 140–160 cm long and 85–95 cm shoulder height, and 50–80 kg in weight; does are 130–150 cm long and 75–85 cm shoulder height, and 25–45 kg in weight. Fawns are born in spring at about 30 cm and weigh around 4.5 kg. The life span is around 12–16 years. Only the bucks have antlers, which are broad and shovel-shaped (palmate) from 3 years. They are grazing animals; their preferred habitat is mixed woodland and open grassland. During the rut bucks will spread out and females move between them, at this time of year fallow deer are relatively ungrouped compared to the rest of the year when they try to stay together in groups of up to 150. Agile and fast in case of danger, fallow deer can run up to a maximum speed of 28 mph (45 km/h) over short distances (being naturally less muscular than other cervids such as roe deer, they are not as fast). 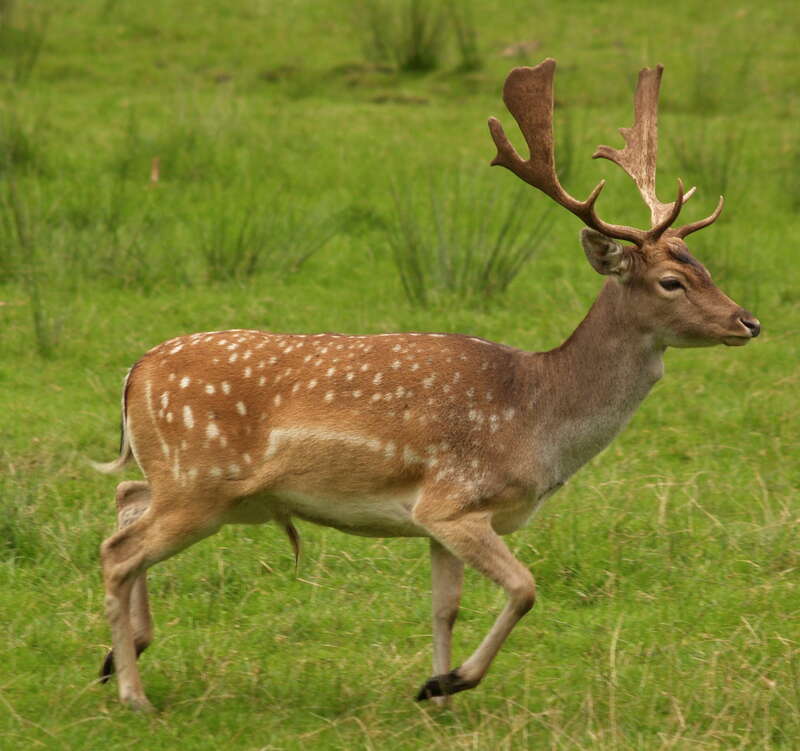 Fallow deer can also make jumps up to 1.75 metres high and up to 5 metres in length. Permission: Creative Commons Attribution-Share Alike 2.0 Generic license. A figure of a stag facing left. It is painted in black, and also engraved in its outline. Note the detail with which the limbs are represented, the way the belly is indicated with a characteristic partition line, and the powerful neck. Furthermore, in the interior of the stag there is a figure of an ibex, of which the cervical-dorsal line is clearly visible. Buck, horse, and fallow deer, (and ibex - Don ) engraved and painted. The first strictly scientific archaeological dig was carried out in 1970, by E. Olávarri. 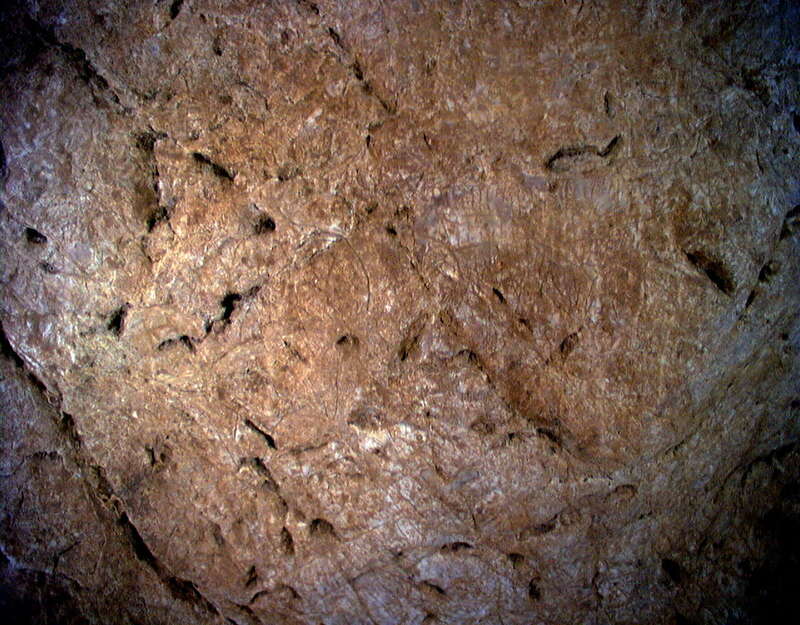 As the exterior deposit had been destroyed, this excavation was limited to several small trial digs in the first chamber of the cave. 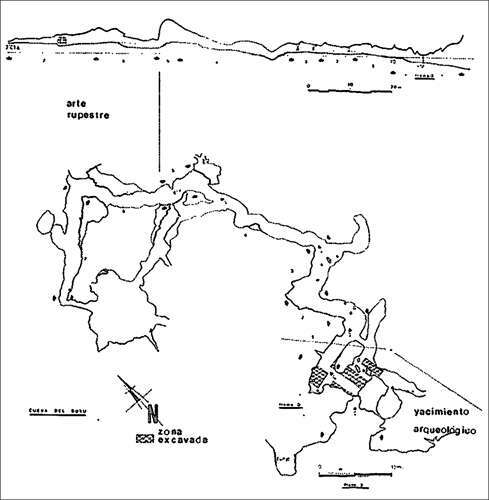 Despite being in only a marginal area of the deposit, this dig and the ones by M. Menéndez between 1986 and 1989 succeeded in finding stratigraphy which could be dated in the late Solutrean. Some of the more interesting artifacts found were two stone plaquettes decorated with engravings and, above all, the tooth of a cave bear which had been carved into the figure of a bird. View of a panel with several animal figures. First of all, we can see a hind facing left. It is drawn with an engraved line, which is completed with black paint. The hind is represented complete, and so we can recognize the cervical-dorsal line and the tail, the rear quarters with two limbs, the belly line (which disappears, but which probably used a natural fissure), one forelimb and the chest. It is difficult to see the head nowadays. A stag is located above the hind. It is smaller, but faces in the same direction and was produced with similar techniques. To the right of the stag, several vertical black lines are above the hind's croup. 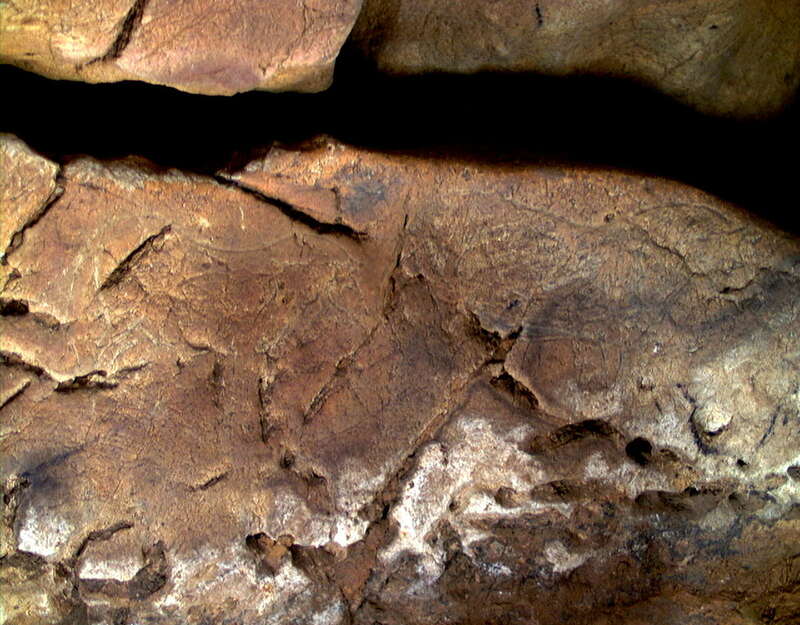 Finally, in the lower left of the photograph, there are the remains of another animal, in very faint black paint. Two deer outlined in black, the same as the photo above. From the entrance gate, there is a distance of 60m to reach the first panel with parietal art: the so-called "Sector A". In this area, a limestone arch marks the start of the roof of a canyon six metres long. When it was discovered, this arch was one metre above the floor. It had a complete figure of a horse (which has not been conserved), two small hinds, one painted in black and the other engraved and painted, and three stags painted in black, as well as a series of short vertical lines in the same color. Continuing towards the end of the cave, Sector B is reached at the exit of the previous passage. This has an assemblage formed by several signs on the right-hand wall; three quadrilaterals and a ladder-shape or scaliform, all engraved. Of the three quadrilateral signs, only one is still conserved; it is a sign divided longitudinally into three bands, with short lines inside and outside. 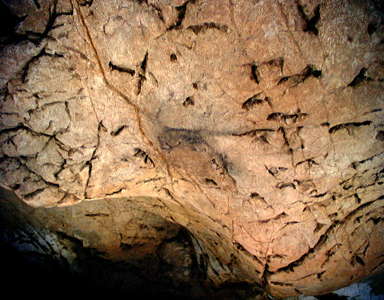 Its morphology is therefore similar to signs found in a number of caves in the center of Cantabria. On the left-hand wall, the first researchers found two magnificent engraved representations of horses which have unfortunately been destroyed by modern inscriptions, and which we can only know today thanks to the photograph published in 1918. Engraved deer and ibex. The deer has touches of paint and seems to be falling, wounded from javelins piercing its chest. At the end of Sector B, the passage turns ninety degrees to the left, and this is the start of Sector C. The densest panel in Cueva del Buxu is found opposite the exit from Sector B, on the right-hand wall. This is 2.3 metres wide, and has several signs and animal figures. The front third of an ibex, facing left, and painted in black is found on the far left of the panel. Another, complete, ibex was engraved on the panel's right. Between these two figures there are as many as ten quadrangular signs, all engraved, as well as a stag's antlers painted in black. Another two quadrangular signs were engraved to the right of the second ibex, and below there is an "E"-shaped sign painted in red. 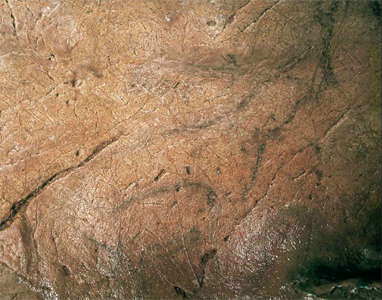 This is a very rare type of sign in Paleolithic art, with its only parallel in the "symbolic inscription" in Gallery B of Cueva de La Pasiega. It is equally worth mentioning that this is the only figure in the cave in which red paint was used. The right-hand wall of this passage has another three groups of engravings, which could represent the same number of animals, although the poor execution of the figures makes it impossible to identify the species. 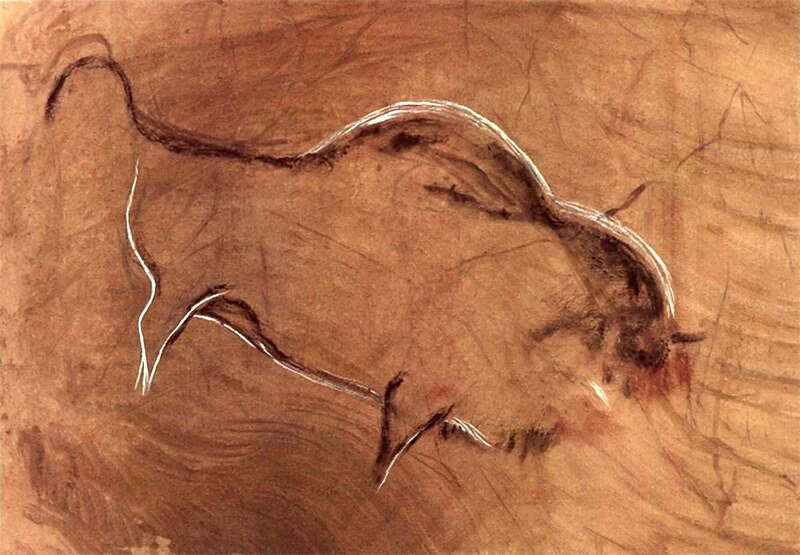 This is a bison, facing right, which is both engraved and painted. In order to produce the figure, the artist also made use of a curve in the wall, and a fissure that acts as the cervical-dorsal line of the animal. This panel is located on the left of the figures of the stag and possible fallow deer, and forms part of the same composition. It is, however, rather faded nowadays. Engraved bison with touches of black colouring. This is a whole figure of a horse, facing right and engraved with a deep line. 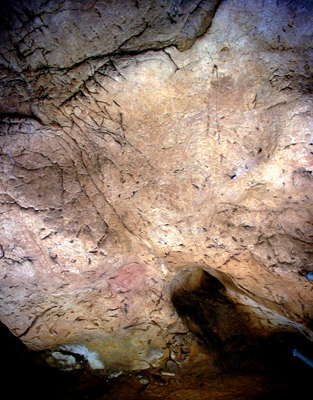 It is one of the best preserved and most characteristic figures in Cueva de El Buxu. It has a head, which is not closed at the mouth, an eye, two ears, mane, cervical-dorsal line, croup, a long tail, limbs and belly and chest lines. 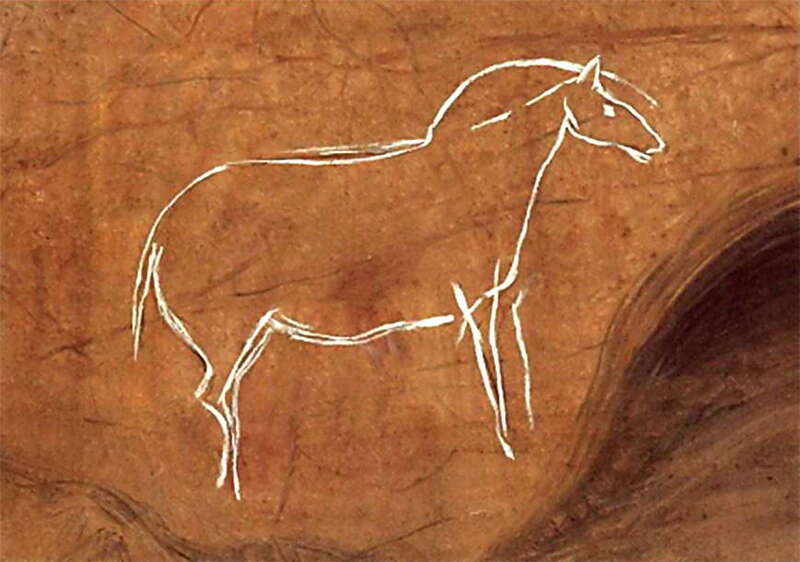 This figure is found on the same panel as another engraved horse. Engraved horse, the same as in the photo above. Two engraved horses. The one on the left is the same as the one shown above. This figure of a horse facing right is drawn with a deeply engraved outline. Other lines fill the interior of its body. Also note the details in the mane, two ears, eye, mouth, limbs in correct perspective and the M-shaped ventral partition. 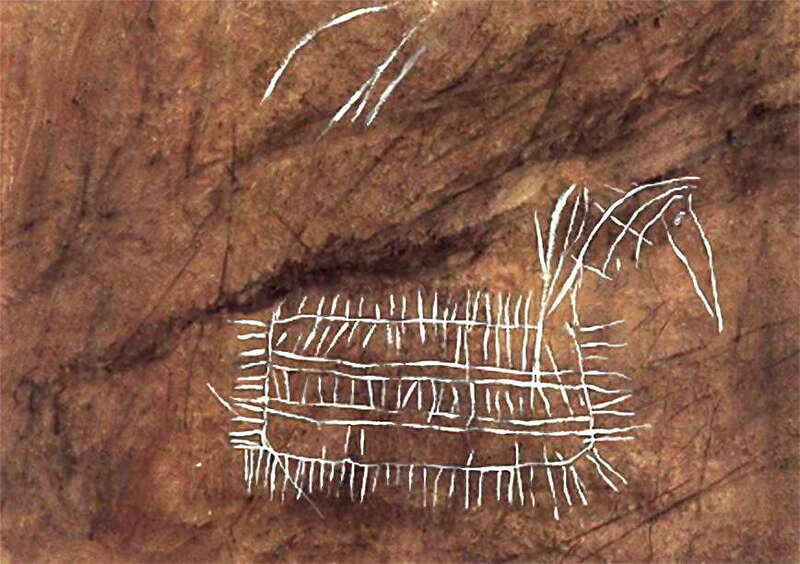 Another two lines drawn in the area of its belly appear to represent a spear wounding the animal. This is the same horse as the one on the right in the photo above. Here are the two engraved horses in one photo. A pair of horses facing right. They are represented by a line, below a deep fissure in the wall, and both are drawn with deep engraving. 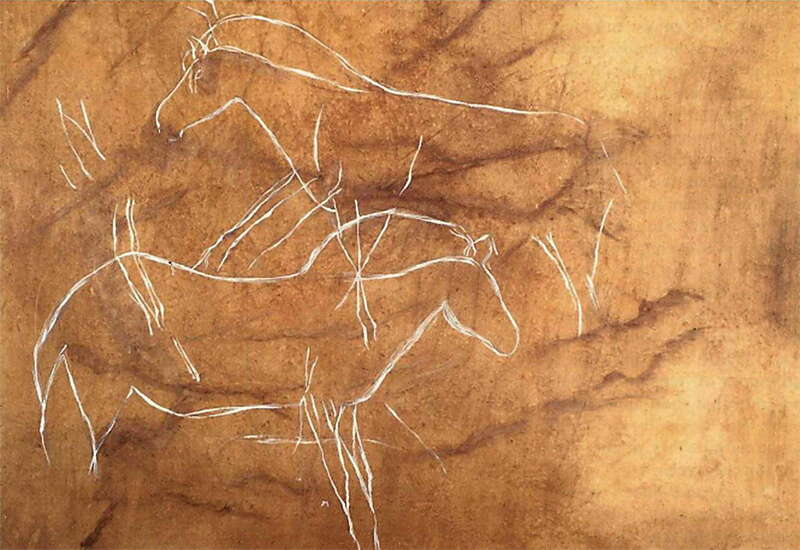 Despite the homogeneity in the technique, certain details are different, such as the lines inside the body and the M-shaped ventral partition of the horse on the right , not found in the simpler figure on the left. An engraved figure of a horse facing right. Compared with the horses on the lower panel, this is a rather crudely drawn figure. The small head is noticeably out of proportion with the rest of the body. This head of an ibex facing left is an outline painting in black. Some colour was apparently spread inside the head. It has two long horns, a series of black lines in its neck, and it shows the start of the cervical-dorsal line and the chest. Furthermore, the figure appears to use fissures in the rock to represent the forelimbs and the cervical-dorsal line. This is the same painting as may be seen in the image below. Fragment of a ibex in black paint, lower left, and ideomorphic paintings and engravings. (Ideomorphic I take to come from "the shape of an idea", which means perhaps that the engraving has meaning for the artist at the time of creation, but its meaning is not necessarily obvious to the later viewer. Tectiforms would fall into this category - Don ). There are four drawings: an ibex and three quadrangular signs. 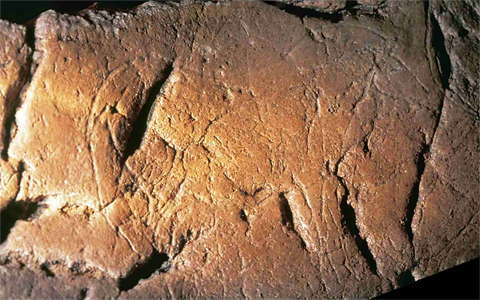 The ibex faces right and is engraved with a single line. 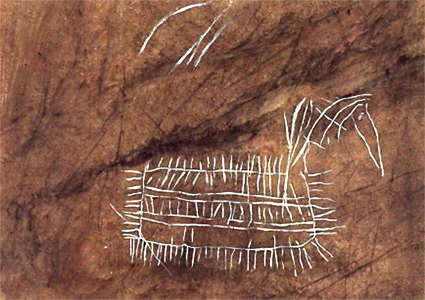 It is a whole figure, with an especially long horn, the only one depicted. To the left there is a quadrangular sign, open in its lower side, and with lines going perpendicularly from its upper side to the floor. The ibex is represented by the cervical-dorsal, belly and chest lines, a short tail, one very simple limb per pair, and a long curved horn. Some details are shown inside the body, and above all in the head, which is drawn with greater care. It has a short head, with the characteristic convex forehead of the species over its eye, and an ear and the mouth are also indicated. Another quadrangular sign below the ibex is more conventional, as it is totally closed, and has a series of engraved lines in its interior. Finally, above and to the right of the ibex a third quadrangular sign can be seen. It is more complex than the others, with subdivisions and other lines in its interior. 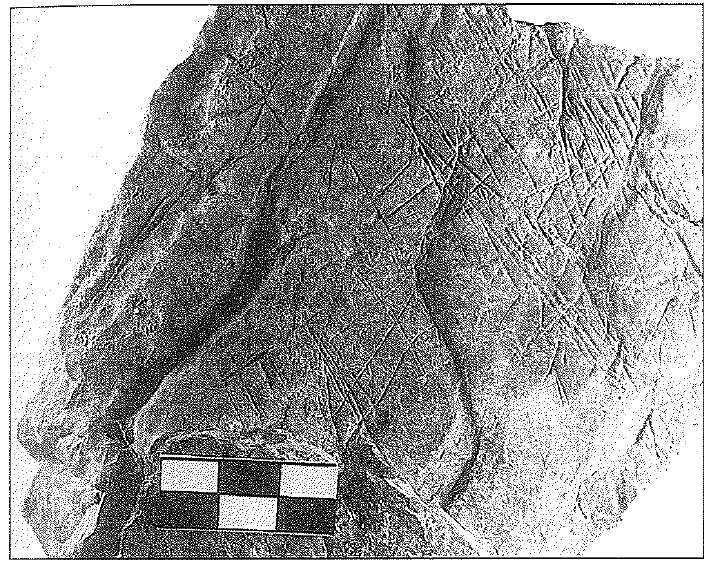 ldeomorphic and ibex engravings, as shown in the photo above. 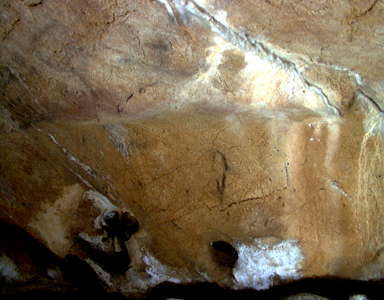 Engraved quadrangular sign, El Buxu Cave, 1998. This quadrangular sign below the ibex is more conventional, as it is totally closed, and has a series of engraved lines in its interior. This quadrangular sign was produced with a single engraved line. The four corners of the figure were drawn, while some engraved lines inside the figure extend beyond its outline. 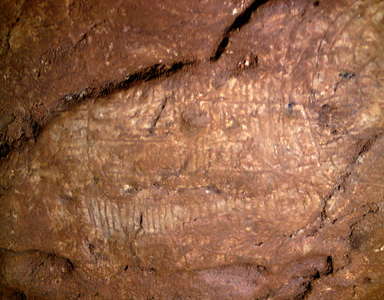 The lower part also has remains of black paint. This appears to be the same sign as the one below the feet of the ibex in the Berenguer (1988) image above. (left) In the interior of this stain of red paint can be seen a sign in the form of an inverted 'E', as can also be seen in the image from Berenguer (1988). There are also several non-figurative black lines below the red stain. (right) This is a view of the panel in the 'Chamber of the Tectiforms'. Most of the depictions here are abstract: quadrangular signs and non-figurative lines. The figure of an ibex, shown in photos above, is found among these signs. This quadrangular sign, drawn with a single, wide and deep line, has numerous lines subdividing its interior. Due to its position, this sign can be seen from any point of the chamber. This seems very similar, but not identical, to the one shown at the top of the Berenguer (1988) image above. Pair of hinds. The one on the left was drawn with black pigment, whereas the other combines paint with engraved lines. Hind figures painted in black with one also engraved. These are the same images as those in the photo above. Continuing along this passage for another seven metres, we find, on the right-hand wall, an alcove with the representations of several animal figures, both engraved and painted in black. 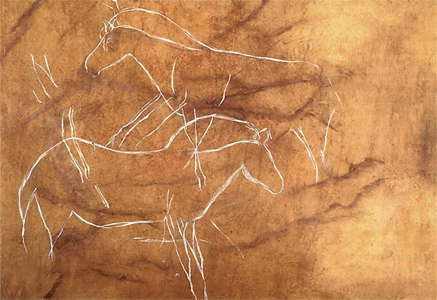 On the left, three complete figures of horses were engraved, and a bison was represented by combining the techniques of engraving and painting in black. Doubtlessly the most significant figures in El Buxu are depicted on the right. The central figure in this composition is a stag in black paint. Although the pigment is badly faded, the head, antlers, chest and back are clearly seen. The broad shape of the antlers seem to suggest this is a fallow deer, although some reticences could be made about this identification, mainly because so far no skeletal remains definitely of this species have been found in Cantabrian Upper Paleolithic sites. It must also be mentioned that the animal is depicted as roaring, with an open mouth, a slightly raised head and a swollen chest. A horse is engraved in the interior of this figure, and below it a stag is engraved and painted in black, and an ibex engraved. 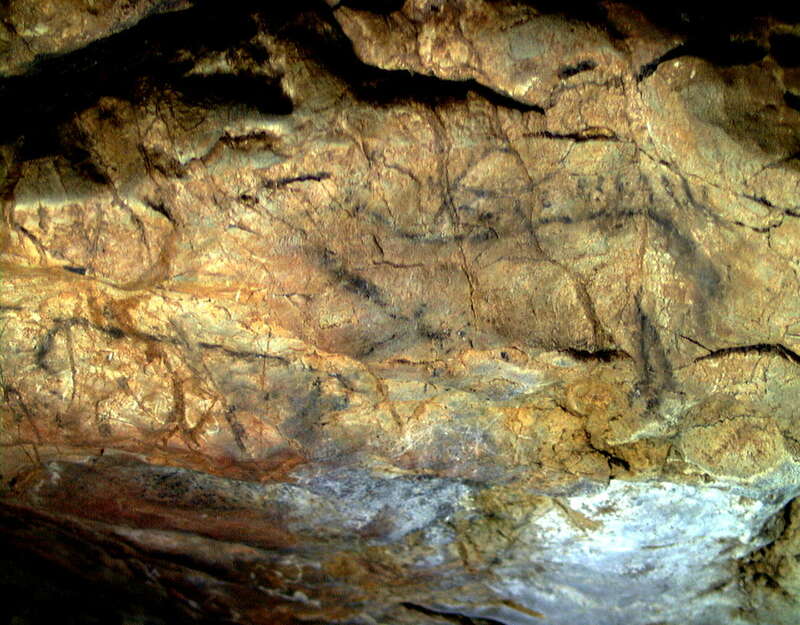 The largest figure in the cave is located in the upper part of this panel: the representation of a stag, engraved and painted in black. This figure has almost completely disappeared, and nowadays it is only possible to see the lower part of the front limbs. A small engraved ibex is found in the interior of this animal's body. Opposite the alcove where the above figures are located, the left-hand wall of Sector C has an engraved figure of a horse. A few metres further on, we come to the last works of art in the cave: a black oval sign, an animal figure which may not be of Paleolithic age, the engraving of a bison and other engraved lines, some of which could form part of a quadrangular sign. This figure of a horse facing right is drawn with a simple engraved line. It was produced in a hollow of the left-hand wall of the cave, where the rock has a cracked surface. The irregularities in the wall do not allow the figure to be seen with clarity. This is an oval-shaped abstract sign, outlined in black paint. 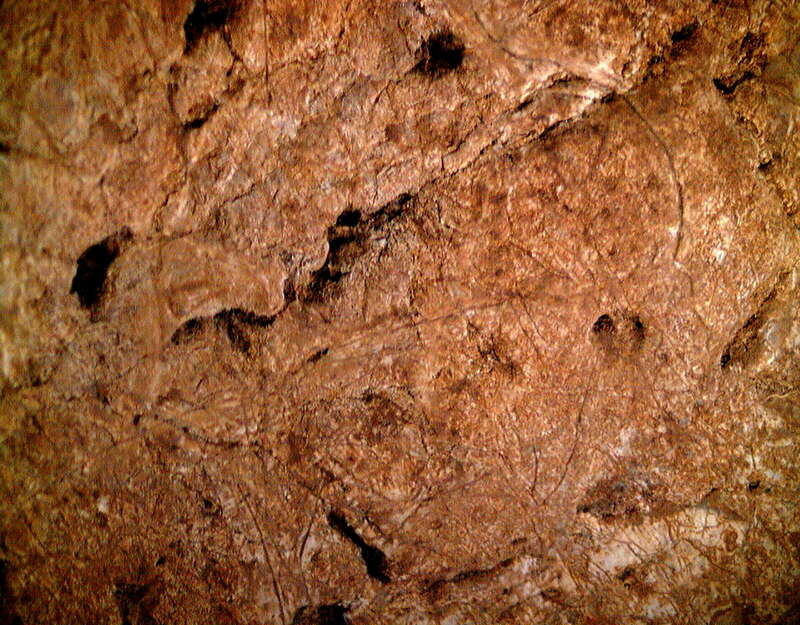 The question of the age of the cave art in El Buxu has not been settled definitively. 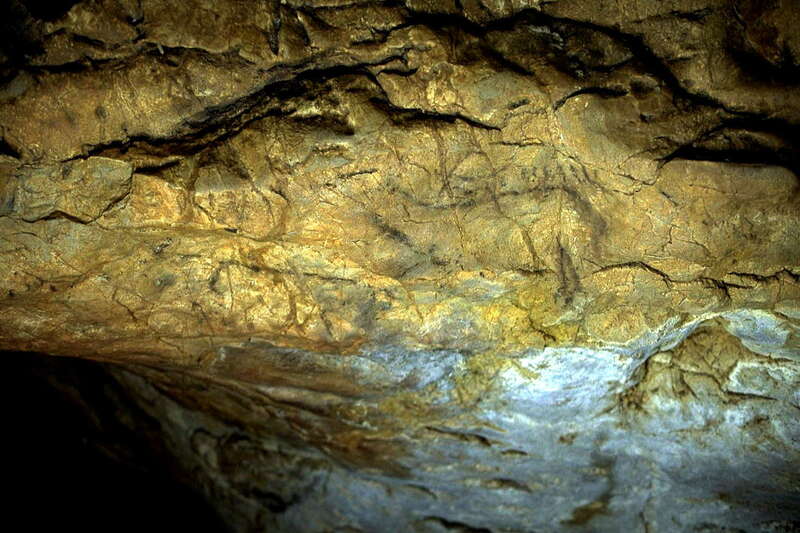 The few cases of superimpositions in the cave suggest that the engravings were produced before the black paintings. 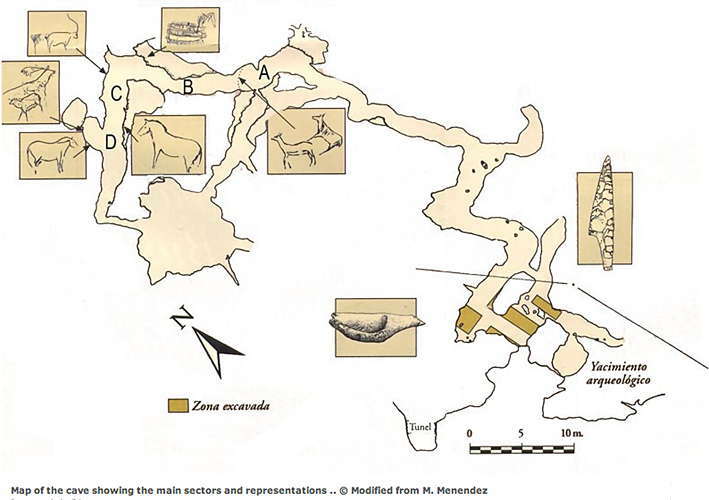 Thus the deer's antlers are on top of an engraved quadrangular sign, and the small engraved horse is below the supposed fallow deer painted in black, and the engraved ibex is below the large stag in Sector D. In Sector C there is a small "parietal stratigraphy", where an engraved quadrangular sign was superimposed by an engraved ibex, and then by lines of black paint. These black lines could belong, however, to the first quadrangle, which would mean that the succession of figures were produced in a short period of time, and might be considered synchronic. If criteria of stylistic dating are applied, the engraved animal figures appear somewhat older than the paintings. Thus, the horse (I) has a sinuous back, and a small head in comparison with a relatively large body. The two horses which are now lost (VI) had a mane which suggested a moment in the transition between Styles III and IV, and a failed attempt to express perspective in their limbs, besides which were represented in a very schematic way, as two lines that meet in the hoof. The same can be said of the engraved ibex (XIIg). 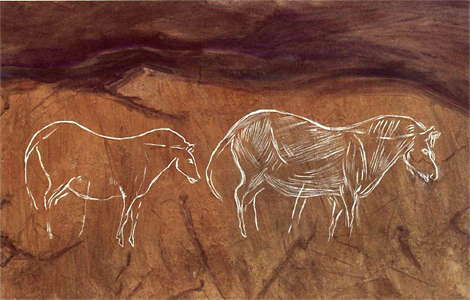 Three engraved horses (XIII) have incorrect proportions, although in at least one of them the limbs were represented with greater realism. 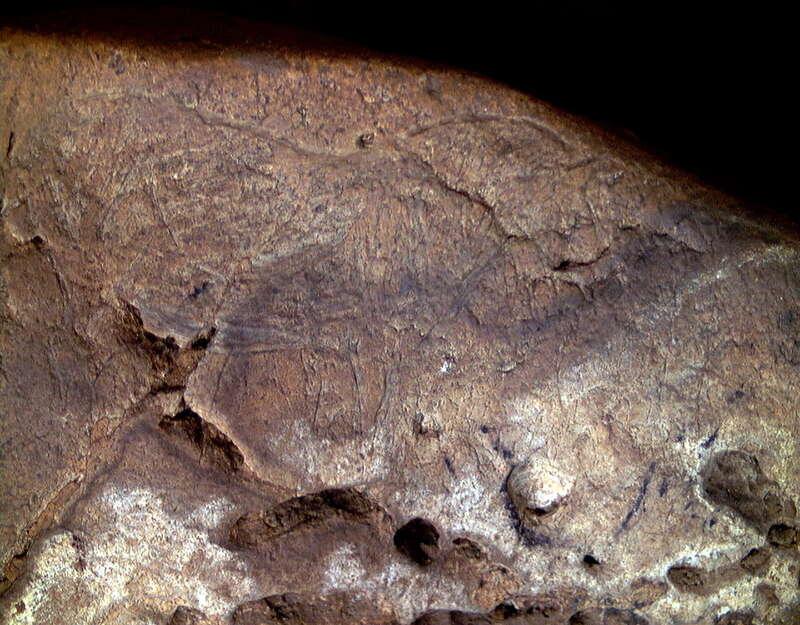 Finally, the recently discovered engravings, representing a bison and four unidentified quadrupeds, are represented in a very rough style, so that if they are effectively of Paleolithic age, they could correspond to an early period, perhaps the Solutrean. Regarding the black paintings, they seem to show characteristics of a more recent period, yet not too distant from the age of the engravings. The clearest evidence lies in the superimposition over the engravings. Although some of the figures continue to show rather archaic characteristics, others seem more clearly Magdalenian, such as one of the bison (XIV). The stag (XVa) situated below the possible fallow deer shows an attempt at expressing perspective in its fore-quarters, as well as certain interior details, such as a ventral partition, and the representation of the muscles at the top of the fore-leg. 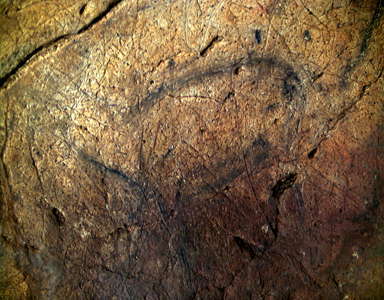 It therefore seems possible to propose that the parietal art of El Buxu was produced in two quite close periods of time. 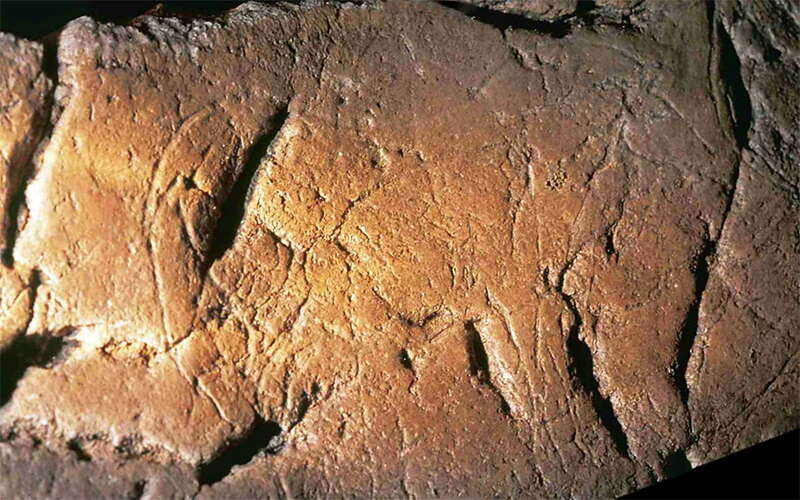 First to be done were the engravings: quadrangular signs and animal figures, which could be included in the latter phase of Leroi-Gourhan's Style III (final Solutrean or start of the Magdalenian). The black paintings, often associated with engraving, were done later, in early Style IV, in the early Magdalenian. 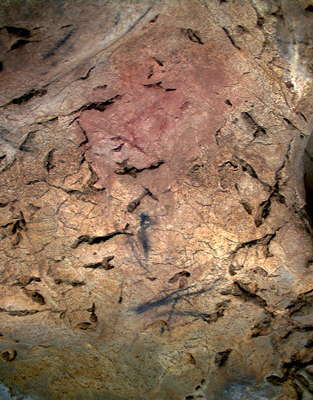 Still unknown is the age of the E-shaped red sign, and other stains in the same color in other parts of the cave and which cannot be identified at all due to their poor state of conservation. Fig. 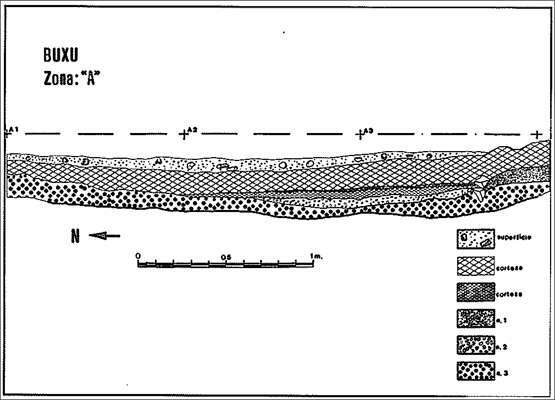 1: Plan and section of the Cave of Buxu. The archaeological site occupied approximately the trench 'O', stretching out towards the South East. This report summarises the work done in the Cave of Buxu (Cangas de Onis), referring primarily to the excavations carried out from 1986 to 1989, incorporating aspects of earlier research. It is thought that these works will be published in more detail after various ongoing interdisciplinary studies. It also forms part of a global project for the study of the Upper Palaeolithic and Epipaleolithic in the area, including cave sites such as Los Azules, La Güelga, and surface deposits such as La Cavada. 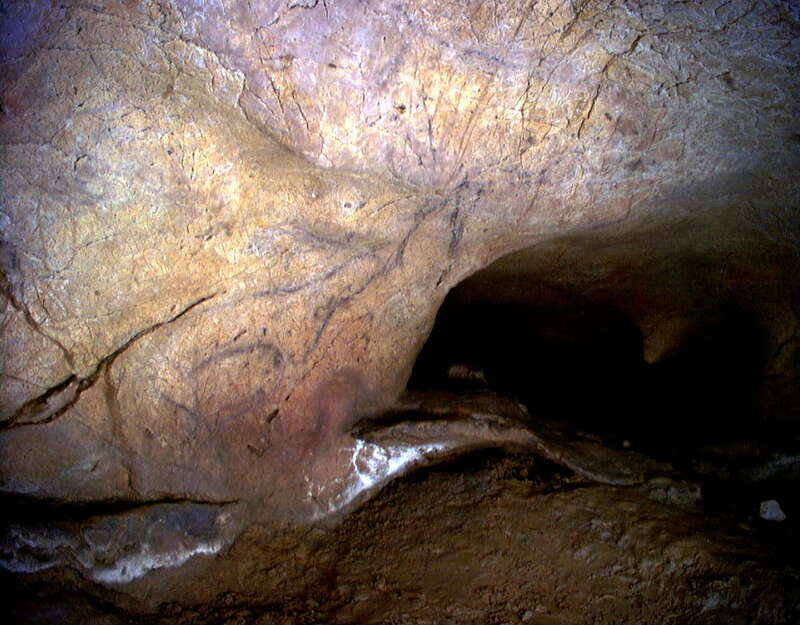 Buxu Cave, known since the beginning of the century for its paintings and engravings (Obermaier et al. 1918) occurs in a limestone outcrop situated in a blind valley, hanging over the valley of Güeña, shortly before it empties its waters into the river Sella. 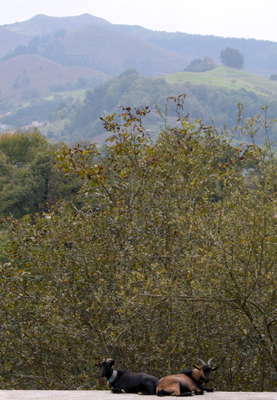 The old shelter roof, which has suffered a major collapse, opens in a southerly direction, at an altitude of around 300 metres, with an excellent view over the valley of Güeña and a commanding height, is at the end of a small blind valley. 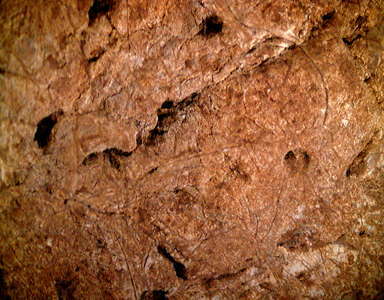 Our work focused on the excavation of three areas located inside the cave, following those made in 1970 by E. Olavarria. These areas are the inner tail of the field, being in some levels very marginal part of it, mostly lost. 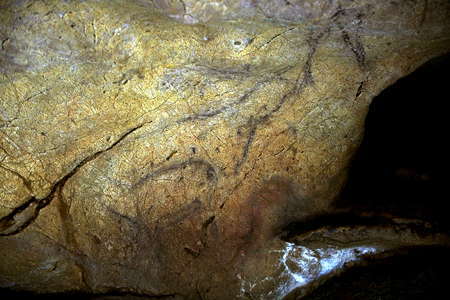 We have also conducted a review of the cave art, which gives some interesting details, especially in the relationship of this with some bone and stone engravings that appeared during the excavations and are stratigraphically well defined (Fig. 1). While geological and stratigraphic study is still being done by M. Holes, we can anticipate some general aspects, and borrow some of his ideas. Furthermore, the stratigraphy of Buxu does not seem overly complicated. The archaeological site was located on a limestone peak and suffered rockfalls, some of whose blocks can be seen in the first collapse today in the lobby. Because of a variety of geological reasons and because of work done in the fifties to open the cave for tourism, most of the accessible archaeological site has been destroyed. 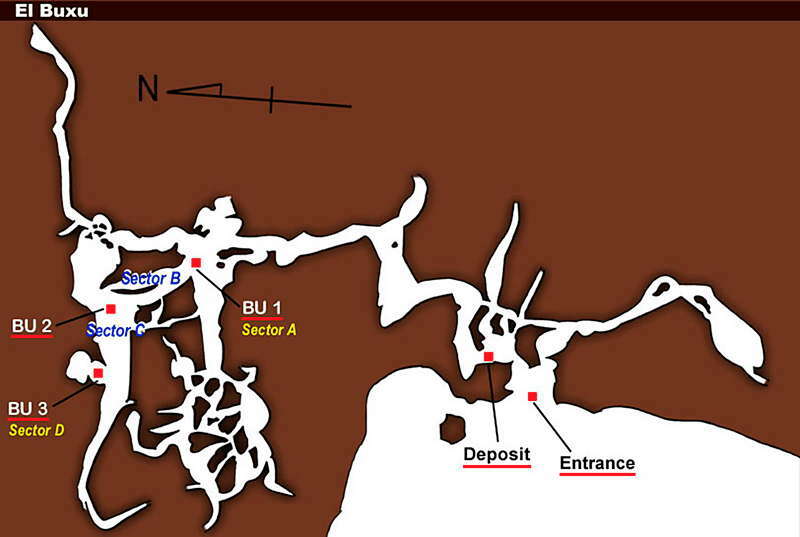 The different excavated areas are located in the extreme northwest (? southeast? - Don ) of the site (Fig. 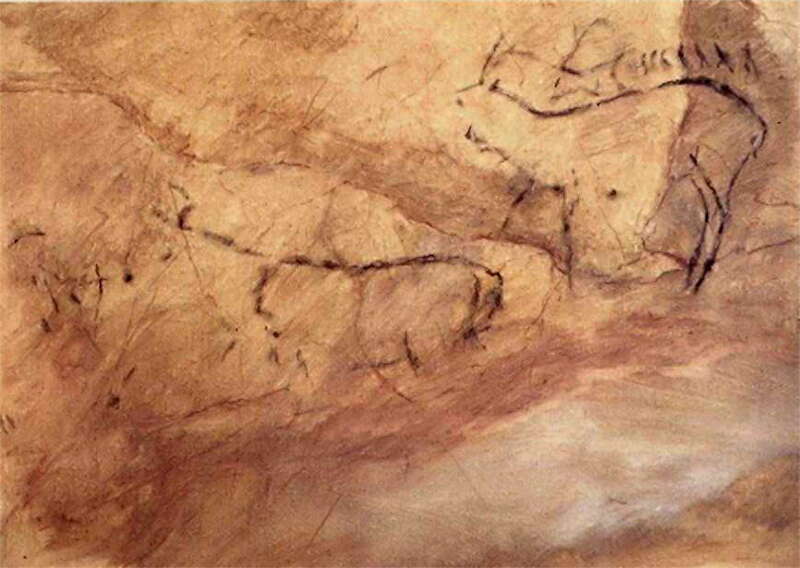 1), in a marginal area of the cave, into which daylight should rarely come. Recent excavations have confirmed the stratigraphy and this has been published for the areas closest to the entrance, where the archaeological levels are protected by thick stalagmitic crusts. However, the above should be reviewed for "Zone B", which appears intact at Level 3, and which corresponds to the old levels 6 and 7. Top Surface: dark brown matrix material and limestone blocks. Limestone crust No. 1. Covers the whole zone. Gains in thickness to the southeast, where it reaches a thickness of 15 cm. Standing on it are stalagmitic thick pillars, which continue through the archaeological levels, thus partially obscuring the Paleolithic occupation area. Level I: Formed by sand (50%) and clay (26%), dark brown. Dipping in the SE-NW direction, ie, "falling" from the outside to the inside of the cave, forming a wedge-shape. It is, therefore, the extreme north of the remains of the last known occupation in the cave, which decrease from the outer overhang to the by then nonexistent No 1 limestone crust. 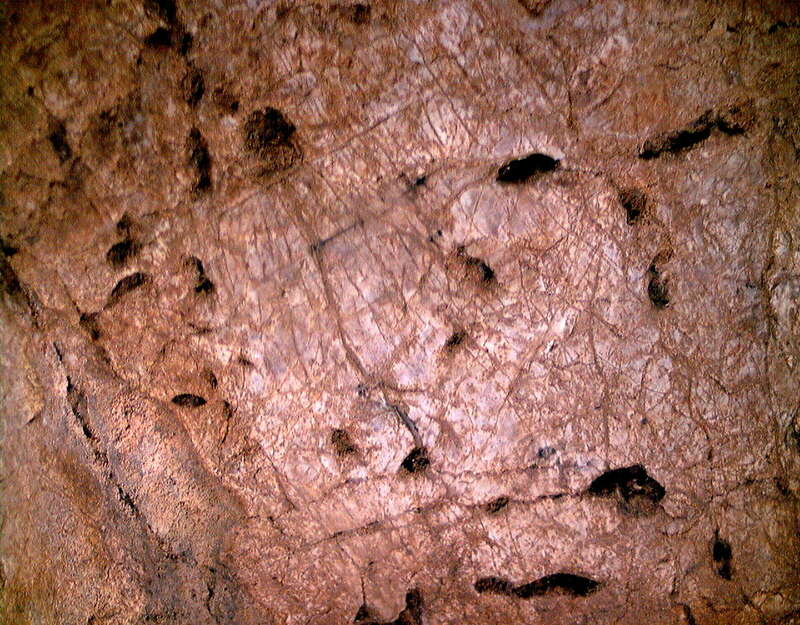 The subsequent formation of this crust completely closed the cave to the outside. The level is placed horizontally at the base, and resting on the crust of level 3, the deposit narrowing inward until it disappears. Limestone crust # 2: partially coats the zone. It is thinner (5 cm. ), and more uniform than the first. Between them is imprisoned some of the "Level 1". Level 2: Sand (55%) and clay (30%), with a high organic content, colour black. It contains many angular calcite pebbles and dips in a southeasterly direction. Level 3: Sand (53%) and clay (33%) of yellowish-brown, very compact. Arranged horizontally, appears in all prospected areas. It contains numerous blocks and angular calcite pebbles. Level 4: Maintains the same sediment matrix as "Level 3". There are some animal remains, but it is sterile from the archaeological point of view. Fig. 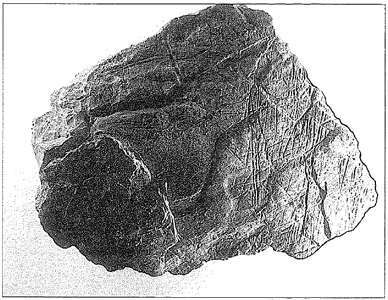 3: planar retouched (this is what we call pressure retouched, common in the Solutrean - Don ) lithic industry. Numbers 1 - 4, belonging to level 2. Numbers 5 - 8 were found in level 3. The lithic and bone industries are found in different excavated areas and levels. Because of the required brevity of this report we are prevented from entering into great detail. However, they could be differentiated into the specific levels, their relationships with the industry, their position in the shelter, and in relation to some existing structures. 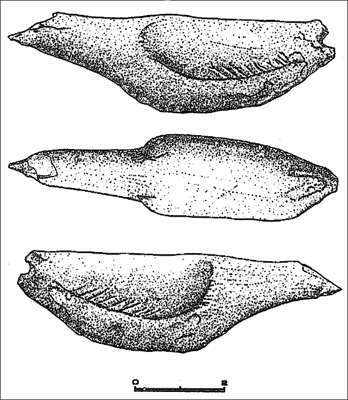 The "level 3" lithic industry consists largely of ​​flint, where burins, mostly dihedral burins, outnumber the scrapers. There is a high percentage of backed blades. Among the characteristic tools are included types with both ends characteristically flat faced, those with a concave base and a notch, and those with just the point of the burin worked (Fig. 3, no 5-8). Level l had so few remains that there was little point in excavating a significant area of it. However, attention was immediately drawn to the high percentage of backed blades and denticulate-backed flakes in some parts of the 'archaic substratum'. Typical pieces were not collected in this level , except for some retouching, conducted in isolation on some flakes. Similarly, flint forms the overwhelming majority of the pieces. The bone industry consisted mainly of the so-called 'little worked bone' with many different types for levels 3 and 2. Sharp bones, polished or altered simply by use, formed the majority of the pieces. For the bone industry, spears are mostly circular section, with others almost square or flattened. Long, polished bone awls are the best preserved pieces common to all levels, including the Level 1. On the lower levels there are various distal and proximal fragments of bone needles with drilling of the eye of the needle from both sides. The stratigraphic position of the levels 2 and 3 seems clear. 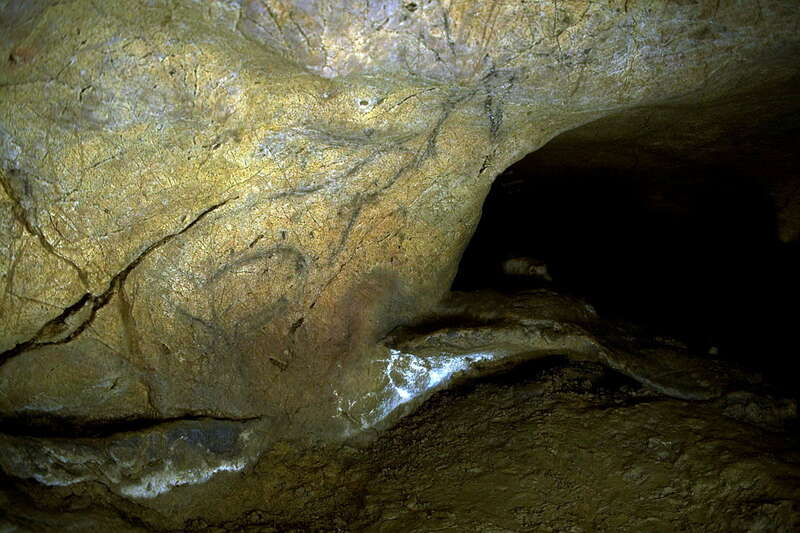 The climatic conditions of sedimentation, along with consideration of cultural elements located their making during the old cold Dryas I, about the time of Laugerie Haute/Lascaux, a time of intense Upper Solutrean occupation in the region. The parallels with other deposits are clear. Levels 9 to 7 of Caldas, undoubtedly the best Solutrean sequence with which to make comparisons, offer very similar characteristics (Corchón 1981 and 1986). Without going into excessive qualifications or links to other data associated with the functionality of the industries or other variables, to be discussed in another publication, it seems appropriate to highlight some differences between the two levels. Level 3 has provided further surface excavation of the other levels. Therefore their data, presence / absence, are more significant. Apart from some specific types of large quartzite pumas, rnusteroide aspect, which have been described (Menéndez, 1984 a), together with the flat face tips and concave base, highlights the absence of typical notch real points, however frequent in the "level 2". Fragments of ribs, cut bones and bone fragments in the form of polished plates, ( omoplates, scapulas, i.e. shoulder blades? - Don ) which present different types of incisions were collected in levels 2 and 3. Usually it is not figurative representations of the kind described by Corchón but paired and bracketed fragments (Corchón 1986). Figure 4. Small sculpture of a bird of the Anseriformes family, comprising ducks, geese, and swans, carved on an "Ursus Spelaeus" cave bear tooth with a hole in the proximal portion, corresponding to the root. As has been previously been described (Menéndez and Olavarria, 1983) , a sculpture of a bird carved from a tooth of Ursus spelaeus or Cave Bear was found (fig. 4). This sculpture shows the remains of a perforation in the proximal wing corresponding too the root of the tooth, allowing us to classify it as a pendant. This important piece is assigned to Level 5 in area B, in ancient stratigraphy. This layer corresponds to the current base level 2. This level, in the area, was partially removed to perform the electrical installation of the ancient cave. We have also found fragments of modern pottery with the remains of Upper Solutrean occupation. However, the lower level (level 3, also Upper Solutrean) appeared intact, and nothing suggests that, despite the partial removal, this area of the cave contributions have come from outside the Solutrean palaeolithic. Thus, there is no doubt about the cultural assignment of the piece, although what part it played in that culture is unknown. Figure 5. (left) Plaque of engraved limestone from Level 2. Figure 6. Enlargement of part of the plaque. Something which can also be described as exceptional is a thick limestone plaque (14x12x4 cm), Which appears profusely engraved on one side (Fig. 5). While this is common in other parts of the Iberian peninsula from the Solutrean, or at later time points, in the Cantabrian area there are few stone engravings for all of the Upper Paleolithic It belongs to level 2, where it emerged together with other small undecorated limestone blocks at a fireplace. Interpreting it is not easy, because it presents a real tangle of thin and thick lines recorded in joints or natural lines, deep scars and parts of the surface that have been skipped. There is a natural tendency to identify figures in these pieces, and the reliability and objectivity of many of the figures recognised in some parts assimilated by the international literature is often questionable. Although the above plaque is still under study, and it is necessary to cleaned the crust covering its lower face, we can anticipate something about its content. Animal figures have been identified, as well as signs and female anthropomorphic figures, among a motley set of lines (Fig. 6). Figure 7 and 8. What may be an engraving of a horse, as well as other signs. In the absence of significant additional data, some interpretations can be advanced on the nature of this site. Animal tests carried out, still partial, indicated the almost exclusive presence of chamois, deer and mountain goat (ibex). Other species represented appear anecdotally - deer and horse and wild boar may once have held a dubious position in the area. You can see two different faunal assemblages that are repeated in all three levels. On the one hand the remains of deer, which are distributed randomly according to the different areas excavated as adults or juveniles in an equitable manner. On the other hand, with ibex and chamois, there is a clear preference for the adult forms over the juveniles. Both groups occupy different biotopes, although they are geographically close at the line of perpetual snow during the time of Laugerie Haute and Lascaux. In any case, examining the geography of the area and the remains found at the site, we point out an area of ​​reduced resources. Similarly, the different distribution of ages of the animals of both groups, indicating the practical practice of different hunting strategies linked to the geography of the valley and the rocky area nearby and to the behaviour of each of the groups hunted. From this point of view, it is interesting to venture the hypothesis of hunting deer by driving, using beaters, herds of females with their offspring to the bottom of the valley that near the Buxu cave. The result would be a random and equitable sharing of ages that we observed in this group. On the other hand, Buxu tectiformes have been interpreted as hunting traps or nets to shut off the animals. The second group consists of chamois and ibex that live in rocky areas and must be killed individually by stalking. This allows the selection of age of the animal, which in this case occurs for adults in both species. The remains of animals reveal that they were killed between April and October. This indicates that the greatest supply of meat was produced in the summer months of the year. Some vertebrae of fish - trout and salmon - point to the occasional use of river resources. Although its importance is difficult to evaluate because of the differential preservation of these remains regarding macromammals. In summary, it appears that levels 2 and 3 of Buxu correspond to seasonal occupations - Summer / Fall centred hunters bringing down deer, chamois and ibex. These activities take place during the Upper Solutrean in the cold period which corresponds to the oldest Dryas I (as for Laugerie - Lascaux). 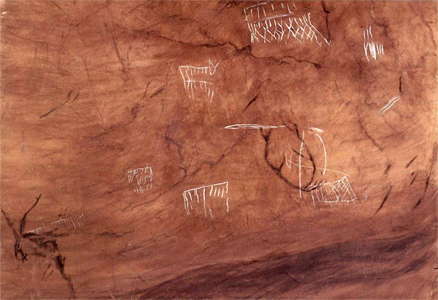 The relationship of the group occupying Buxu occasionally with other sites in the area are being studied, as well as the relationship that may exist between the site, its surroundings and rock art that appears in the cave. Corchón, M., 1986: El Arte Mueble Paleolítico Cantábrico: Contexto y análisis interno, Centro de Inv. 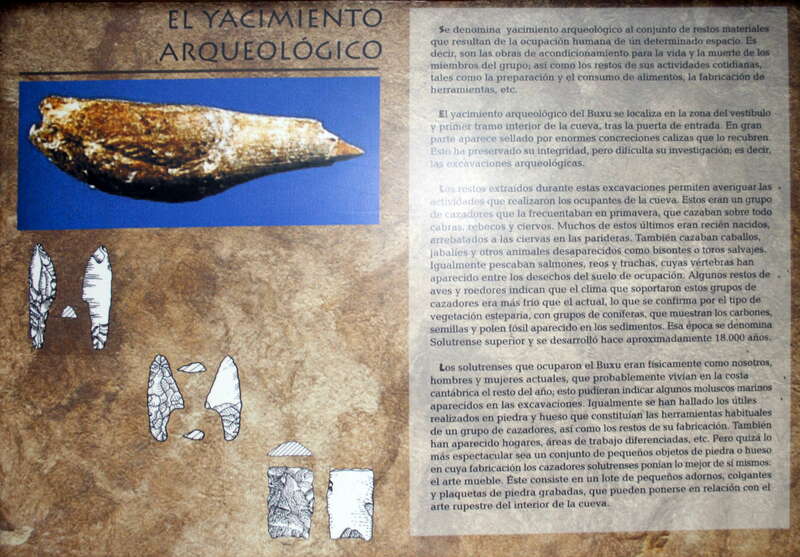 y Museo de Altamira. Mon. No. 16 Mo. de Cultura. Madrid. Kuhn, H., 1966: The Rock Pictures of Europe, Sidgwick & Jackson softcover editions, no.2. 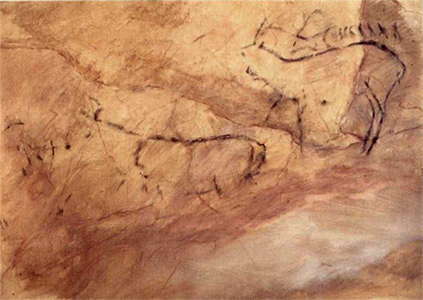 Menendez, M, Soto E., 1984: La cueva del Buxu Boletín del Instituto de Estudios Asturianos 38:143-186, 755-810. Menendez, M, Olavarri E., 1983: Una pieza singular de Arte mueble de la Cueva del Buxu In Homenaje al Prf. Martin Almagro Basch. T.I. 319/329. Madrid. Obermaier, H., Vega del Sella, C. de la, 1918: La cueva del Buxu CIPP, Memoria no. 20. Madrid.